Successfully Added LED License Plate Holder - Personalize Your Ride to your Shopping Cart. License plate holder with LED scrolling message display for installing on vehicles. 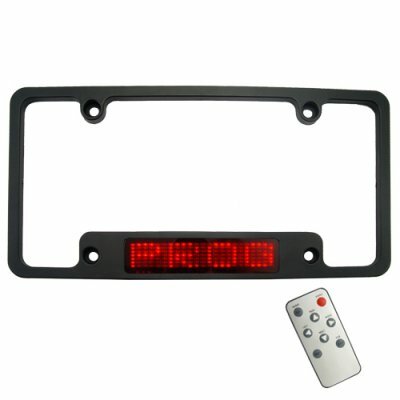 This license plate holder can be programmed with any user typed scrolling message in bright red LED's. Share your words of wisdom with the world with this fun LED display! This unit can be programmed with up to five different messages, allowing you to change your message on the fly based on your current need. A great car accessory for business or fun. License plate holder with LED scrolling message display. Share your words of wisdom with other drivers. on 2010-02-25 02:03:55 Great product for the price! Awesome.... the LEDs are very bright and clear. Love the fact you can program 5 different messages. Easy to install. Once installed and programmed this is an awesome product!